On the Stairs, originally uploaded by pamhule. Two men are relaxing on the stairs of the James Farley Post House across from Madison Square Garden on a warm Sunday. I found that black and white suited the scene well. 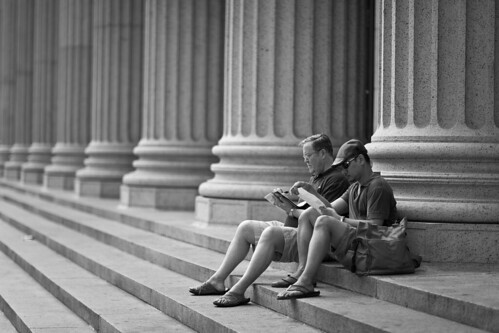 There wasn't much color in the composition to begin with and I like how the two men blend in with the pillars. Still, the 1.2 aperture makes the men stand out just enough.